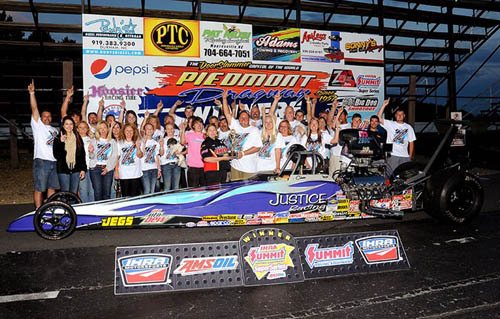 JULIAN, N.C. -- North Carolina's finest took center stage during the opening day of the Division 9 Summit Racing Equipment Team Finals as six more drivers punched their ticket to the Summit World Finals next month to compete for the Summit SuperSeries World Championship. Tim Lucas (Top ET), Brian Perkins (Mod ET) and Noah Strickland (Junior Dragster) each won their respective classes on Friday during the opening day of the D9 Summit Team Finals, while runner-up finishers Michael Paschal (Top ET), Jim "Bo" Sells (Mod ET) and Dawson Wiggins (Junior Dragster) also advanced in the Summit SuperSeries championships. 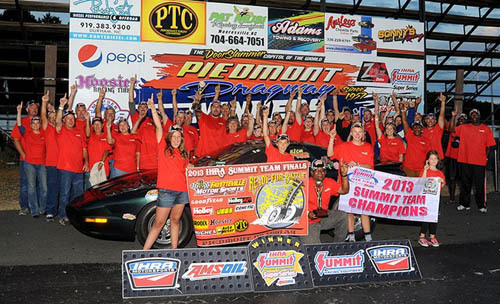 In the team competition Fayetteville Motorsports Park took the overall crown at the Division 9 Summit Team Finals with 67 points, 20 markers ahead of runner-up Greer Dragway. 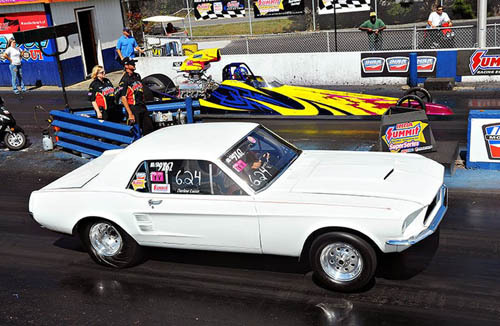 Mooresville Dragway was third with 46 points, followed by Farmington Dragway (44) and Dunn-Benson Dragstrip (41). The remainder of the top 10 were Piedmont Dragway (34), Elk Creek Dragway (22), Coastal Plains Dragway (14) and Rockingham Dragway (12). 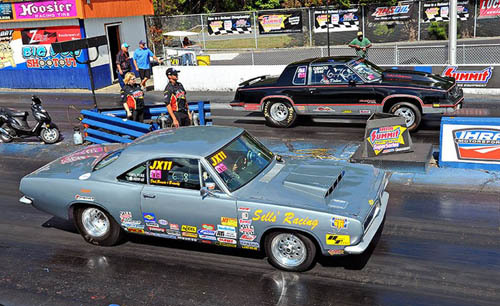 In easily the closest battle of the first day of competition, Fayetteville Motorsports Park's Tim Lucas took the win in an incredibly close race with Farmington Dragway's Michael Paschal. 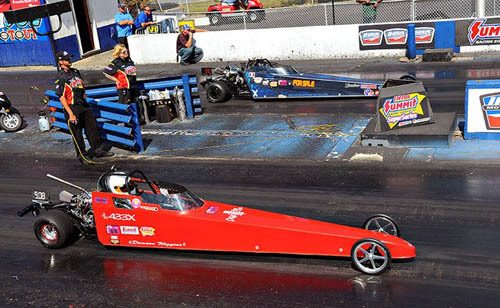 With the Top ET title on the line, Lucas edged his opponent by the slimmest of margins at the line with a ..010 reaction time to a .014, and ran a near dead-on 6.247 elapsed time at 107.75 mph on a 6.24 dial. Paschal ran a 4.634 on a 4.62 in a runner-up effort. In Mod ET Dunn-Benson Dragstrip's Brian Perkins was handed the win when the lone non-North Carolina track representative Jim Sells of Elk Creek lit the red bulb by -.008. Still, Perkins closed out the race with a 6.734 on a 6.70 dial with a .030 reaction time. 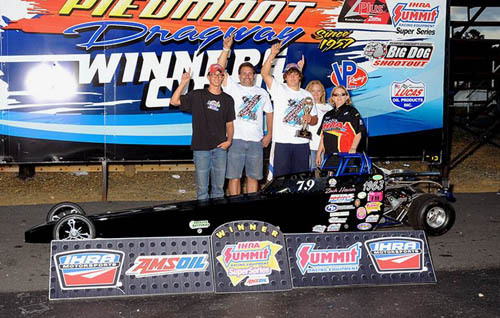 Noah Strickland, representing Mooresville Dragway, took the Junior Dragster title over Dunn-Benson Dragstrip's Dawson Wigging who ran just a tad too quick on his dial. Strickland had a .049 light and ran a 7.916 on a 7.90 dial at 81.65 mph while Wigging had a 9.043 on a 9.08. Other big winners at the Division 9 Team Finals were Main Event winners Cameron Manuel from Farmington Dragway in Top ET, Jeff Longhany from Fayetteville Motorsports Park in Mod ET and Zachary Houser from Farmington Dragway in Junior Dragster. 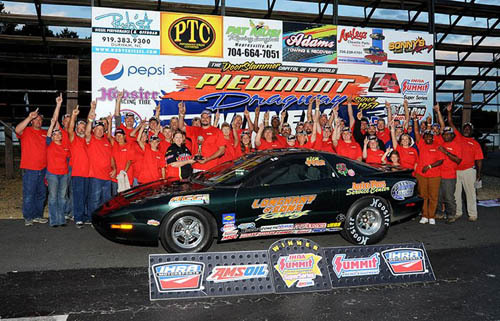 The following are the final results from the Division 9 IHRA Summit Team Finals at Piedmont Dragway. Fayetteville Motorsports Park celebrates team win.